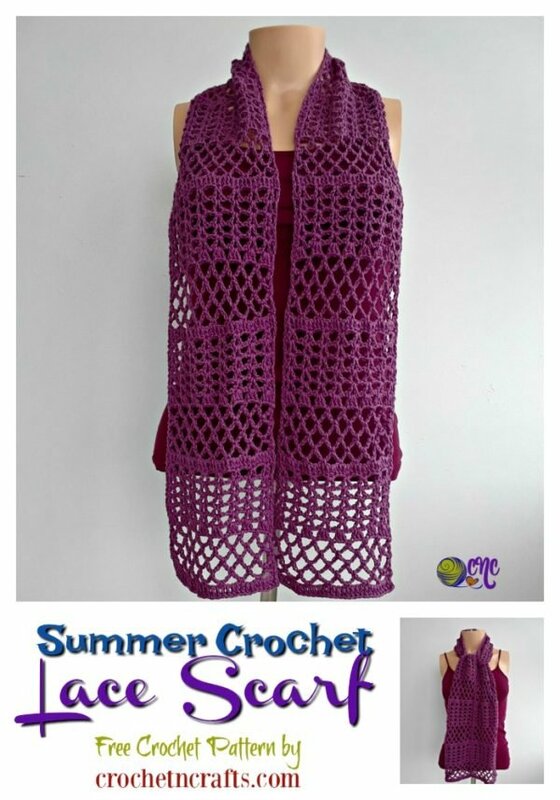 This summer crochet lace scarf pattern works up quick and easy for the intermediate crocheter. It features a lovely open lace, which is designed to keep you cool in the summer months while adding an extra layer of style to your outfit. The summer scarf can be worn long or tied in a knot at the front. 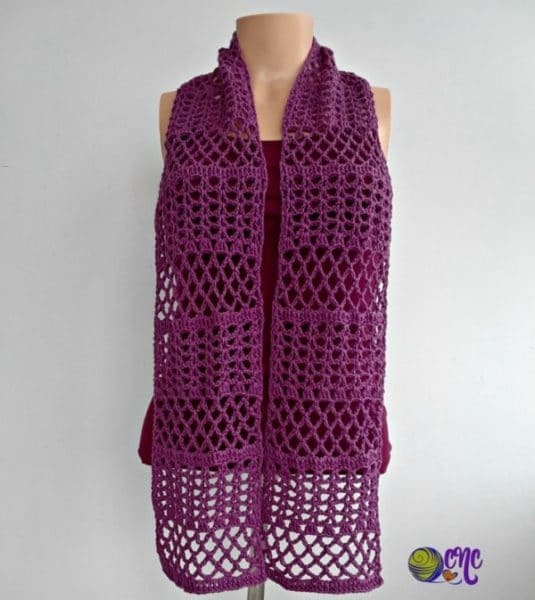 For this pattern I decided to use the same stitch pattern as I used in the Crochet Lace Wrap. It is easy to adjust in size in regards to width and length. And you can wear it loose over the shoulders. Or tie it in a knot to keep it around your neck nice and secure. This is actually my personal favorite, but the choice is yours. 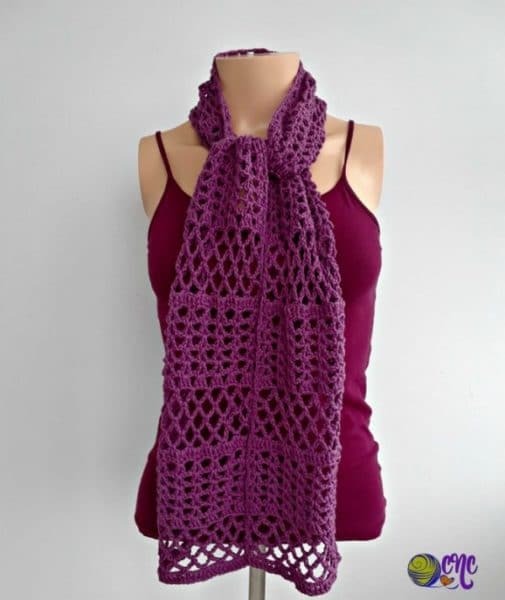 Another bonus of this pattern is that it is crocheted so that both ends of the scarf look the same. 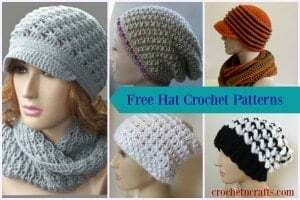 So basically you crochet it to half the length that you want. Then you join your yarn to your starting chains and work until your length matches the first half. Finished Size: 60″ long by 6.5″ wide. Gauge: 25 sts = 5″, however, it’s not important as you can easily adjust in width and length. V-St: (dc, ch 1, dc) into designated st.
Ch 36, or any multiple of 4. Row 1 (RS): Dc in 5th ch from hook an into each ch across. (Skipped chs count as first dc.) [33 sts] Turn. Row 2 (WS): Ch 3 (counts as first dc, now and throughout), sk next st, (v-st, ch 1) in next st, *sk next 3 sts, (v-st, ch 1) in next st; rep from * across to last 2 sts omitting last ch-1, sk next st, dc in last st. [8 v-sts] Turn. Rows 3-6: Ch 3, (v-st, ch 1) into each v-st across omitting the last ch 1. Dc in last st. Turn. Row 8: Ch 1, (sc, ch 5) in first st, (sc, ch-5) into next ch-1 sp and into each ch-1 sp across; sc in last st. [8 ch-5 sps] Turn. Row 9: Ch 5 (counts as first dc and ch-2 sp, now and throughout), (sc, ch 5) into first ch-5 sp and into each ch-5 sp across omitting the last ch-5; ch 2, dc in last st. [7 ch-5 sps and 2 ch-2 sps] Turn. Row 10: Ch 1, (sc, ch 5) in first st, (sc, ch-5) into next ch-5 sp and into each ch-5 sp across; sc in last st. [8 ch-5 sps] Turn. Row 12: Ch 1, (sc, ch 3) in first st, (sc, ch 3) into next ch-5 sp and into each ch-5 sp across; sc in last st. [8 ch-3 sps] Turn. Row 13: Ch 3, dc into first ch and into each ch and st across. [33 dc] Turn. Rows 14-61: Rep rows 2-13 4 times. Fasten Off at last row. Attach yarn to opposite side of starting chains making sure that WS is facing, and repeat rows 2-61.
would thus make ok with a much larger hook? Make a lacy shawl? Yes, you can use any yarn and hook size.